For this year's Curbly Halloween Challenge, we came up with a simple, classic costume that you can pull together in only a few hours. We made a life-size couple's photo booth costume that is as easy to do as it is charming. Read on to find out how. If there is an area of home decor that I need help with, it's cutting photo mats for improperly-sized art and frames. Seriously. My mats look awful. I get so impatient and just kind of "wing it". And it totally shows. Thank heavens someone is showing the rest of us how to do it right! Okay, you guys. This is just plain cool! Think of all the different images you could turn into candy. THEN... think of all the different occasions you could use said candy! You've got party favors for your next, oh, ten parties covered with these bad boys. In the spirit of the new year, we're taking a look back at some of some favorites from the archives. Because old acquaintance should not be forgotten, we're bringing some inspired projects back to mind. Today, take a look at a DIY photo booth that is sure to be a hit at any 2012 bash! There is something so classic about Polaroid pictures. And mini polaroids? Be still my heart! Here's one easy way make your pictures even more memorable. This week marks Curbly's fourth birthday! We're pretty excited, and so we're bringing you some of our favorite original DIY projects and how-to posts from the last four years. This one's from Curbly's most established Featured Writer, DIYMaven. This is a really fun and effective way to make a little photo album--all without using glue or adhesive in its construction. It’s a great way to showcase your photography. It also makes a great ‘brag book’ for images of your favorite children--furry or otherwise. A little strange, a lotta fun, these animal photo holders are a snap to make, thanks to Ohdeedoh for deciphering PhotoJoJo's ready-made variety. They're also a fraction of the cost of the latter too! On Friday, I'm headed to the infamous Dyker Heights Light Display in Brooklyn, and will be taking my new Nikon D90 in tow. But, no matter how carried away these holidaysters get - one Clark Griswold-disciple reportedly pays more than $5,000 in electricity each season - there's still a whole lotta black, and very little light, making for some tough shutterbugging. How To: Make Photo Puzzle Blocks. It's true...everyone loves blocks. Still. Always have, always will. So, Photojojo came up with a tutorial to create a set of blocks you'll never be embarrassed to leave out when company comes over. Upon visiting my local FreeGeek space, I noted the bubbling pile of e-scrap...techno goodies that will never be much use for a frankensteined personal computer. Did I see a potential resource of microchips, LEDs, and switches? Of course, but I wouldn't know what to do with 'em. So, instead, I started slicing, and came up with this very easy, customizable, and essentially cost-free picture frame. Oo, oo, oo. You gotta love the possibilities opened by the battery operated LED tea light. 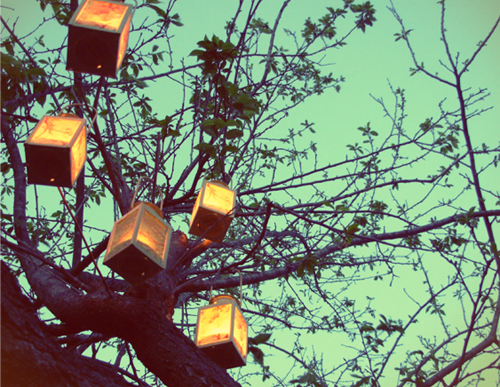 Case in point: these photo lanterns from Ivy Kanaley from a A Field Journal. Read the full tutorial on Decor8. DIY: The Perpetual Photo Wall Calendar. Handmade. Graphic. Photography. Useful. This DIY perpetual photo calendar really does have it all. Make one yourself with this tutorial from Sandy at Photojojo. 1. Find the numbers and shoot em. Build A DIY Panoramic Tripod Head for $10. The wealth of online stitching software should inspire any digital camera owner into creating their own panoramic photos. To ensure that these turn out as best they can, a specialty panoramic tripod head does the trick. But don't rush to the photoshop to get one for hundreds of dollars...instead, head to the hardware store with a Hamilton.